The great housing bubble and crash of the 2000s is drifting into history, but remnants of its devastation still haunt many cities. Still worse, there are many cities displaying some ominous signs of housing troubles on the horizon. In order to help people anticipate a potential future downturn, GOBankingRates conducted a housing study that analyzed more than 50 major U.S. cities. The principal factors evaluated include the percentage of homes with mortgages in negative equity, the total number of homes in negative equity, the number of homes at least 90 days late on their mortgage payment, the negative equity delinquency rate, homeowner vacancy rate and rental vacancy rate. 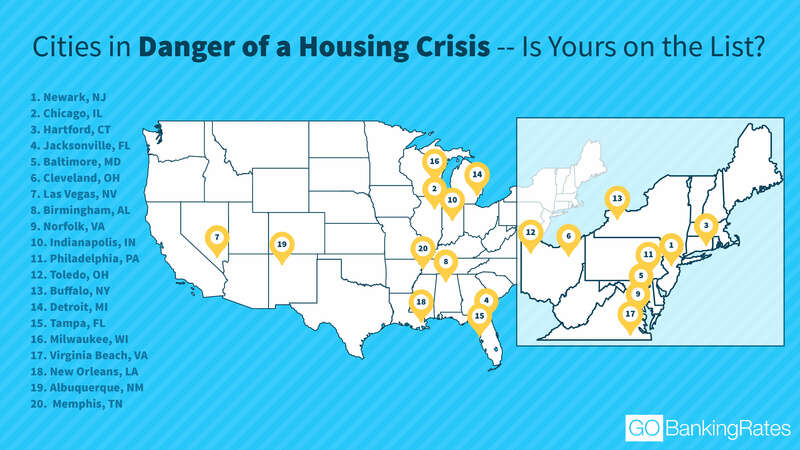 Keep reading to see which areas might be hit hardest by the crisis. In many major cities across the country, the number and percentage of homes that are “underwater” — i.e. homes in which the amount owed on the mortgage loan is higher than the market value of the house — are disturbingly high. In Chicago, America’s third-largest city, close to 72,000 homes are underwater on their mortgage, almost a quarter of homes with a mortgage. The most endangered city, however, is actually Newark, N.J. Though Newark has far fewer homes in negative equity — around 4,500 — it’s also a much smaller city than Chicago. Consequently, Newark has almost 30 percent of its homes in negative equity, and a fifth of these homes are delinquent on their mortgage payments. Property values are central to a city’s economy. That’s because home equity plays a key role in consumer spending. Homeowners often use the equity in their homes, which is based on the market value and balance on the mortgage, to take out loans and lines of credit to fund major purchases and milestones. But when home values dip too much, negative equity becomes a problem. With their ready source of liquid funds now cut off, homeowners tend to dial back spending and focus on getting back to even. It is this kind of reactive drop in consumer spending that can ruin a city’s — and the nation’s — economy. So even if you don’t live in these endangered cities, you can still easily feel the shockwaves from a housing crash. Check out the full list of cities in the study and where they rank. GOBankingRates determined which places are most in danger of a housing crisis based on three factors: (1) percentage of homes with mortgage in negative equity (also called, “underwater”), (2) total number of homes “underwater”, (3) number of homes at least 90 days late on mortgage payment, (4) negative equity delinquency rate, all sourced from Zillow; (5) homeowner vacancy rate, and (6) rental vacancy rate, both sourced from the Census Bureau.